Should they not be AKONGA and not students? I will answer my own question. with Parata as minister and Sharples as deputy minister, and Don Key as prime minister one should be able to make the correct answer. John, the “Curriculum Principle” link doesn’t seem to work – can that be fixed ? If part Maori students want to identify with primitive rock scratchings done with a piece of charcoal by a bored possible part ancestor while waiting for their cousin to cook (as in being the main ingredient of dinner) on an afternoon many centuries ago – hey break a leg. But to attempt to coerce other students – Pacifica, all manner of Whites and other ethnicities into turning their backs on the complex, sophisticated and technologically advanced culture(s) that inspired and created the town of Oamaru, and substitute a rock scratching? – that is nothing less than the machinations of a criminally insane mind. What do the parents think of their children being taught by the criminally insane?? I’d say they’re mostly saying the same as us behind closed doors, but won’t say it outload. We live in a very sick society! …and yes its a sick society alright ….at the moment we have the baboons, jackals and hyenas running the zoo! Let’s hope it just takes one brave person to speak out and that is followed by another and then it quickly goes viral. I live in eternal hope this will happen somewhere very soon!! Once one or two know they have the backing of others, there should be no reason why they can’t all let their feelings fly. Go for it people!! Something has to get everyone moving. Let’s hope this is it. What a disgrace. Hope the parents have something to say. I know I would!! I had problems with my kids school last year when my son refused to accept the Social Studies teachers version of who arrived here first. I had to go several times to meet the maorified Principal and his maorified deputy. They told me that maori were here first…that is the official version. End of! They seemed shocked that there could be a differing version. Once brainwashed, adults seem brainwashed for life. Almost like one of those nutjob cults that pops up every now and then. Bet half these dunces spent time at Centrepoint and thought Potter was the messiah! The nutjob cult is in the driving seat in NZ. I, and the offending schools, can be very thankful that I don’t have children at school any more. I would very quickly become persona non grata, because I would cause a continuous fuss. That is, if I didn’t just take my children out of school and home school them but many don’t really have this option. Helen, I tried causing a fuss at an Auckland school which was failing my son, and soon realised I was wasting my time. I just got the same PC clap trap and barriers put in front of me. We couldnt home school him, so I took him out and put him into a private school, which I couldnt really afford but I had no choice, and he did way better. I feel really sorry for both pupils and parents….It seems schools are now just re education camps. Its criminal! I wonder how long this will go on? We should be emailing the school to express our disgust.I bet there are many parents who are unhappy with this but are too scared to speak out. Go for it. I dare say it will come as a shock to these well-meaning people to be criticised in this way, so be gentle, but firm! Of course, students with half a brain are going to look at the stark contrast between these cultures and know which is responsible for their good health, prosperity and enjoyment of life that results from thousands of years of technological advancement. That rock drawing was probably created about the same time as Newton developed his theory of gravity. I have lived in the Waitaki Valley for several years, and my children attended Kurow Area School. I know lots of people from Omarama to Oamaru and I know for a fact this rubbish won’t go down well with them. I hope this is the catalyst that starts the backlash on a national scale. I would not be surprised if these rock scribbles will get vandalised. 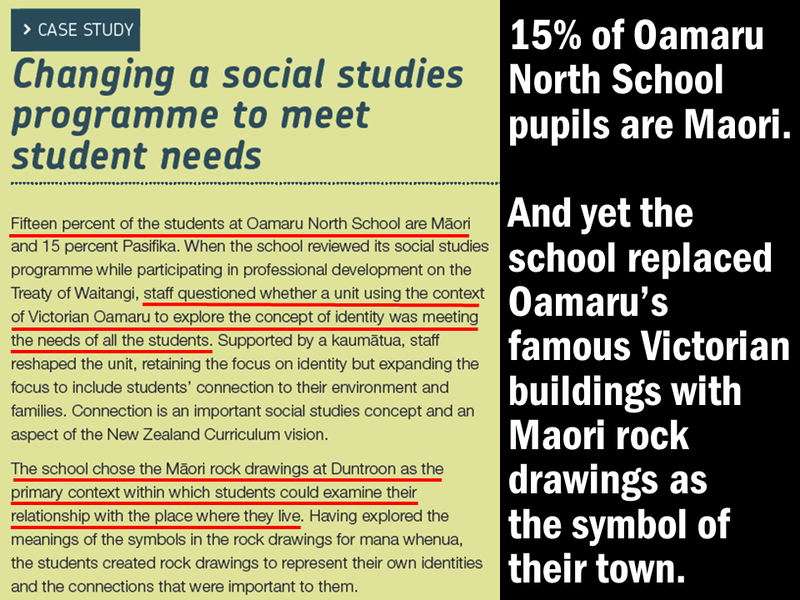 I have emailed Oamoru north school and asked for the names and the organisation responsible for changes in their social studies curriculum, pointing out (part) maori make up 12 to 14% of the population and then they are maybe nothing to 25% maori blood at most,i was not rude or aggressive, how about everyone does the same, easy to all moan and groan lets get out and have a real crack at this , cheers. Yes,I have been hearing from a few colleagues/friends re the requirements in the curriculum. However I can assure you that ‘no-one who is anyone’ (with brains) is taking this seriously i.e. teachers who have experienced the OTT changes. Young teachers are of course indoctrinated from the start but I know some of the students who are in training are baulking at the irrelevance of most of this stuff – and the reason is that it has all been concocted up by the ‘few’ who are desperately trying to convince themselves that this is the way to engage in the height of Maori culture etc. – conveniently forgetting of course about the wisdom of the Waitaha, for example. At university all the papers presented have to have all their titles and info in Maori. Of course the translation doesn’t work – no words for these concepts and it just ends up as a long string of syllables that no-one can read or bothers to look at. Honestly it is all PC stuff, ridiculously unintelligent, will not take root and the way to evaluate it seriously is in relation to a globalizing world. Parents and true (note I say ‘true’) educators alike know where the focus has to be and that ‘Te Reo’ to anyone beyond these shores is only likely to be thought of as place in New Zealand where one might launch a dinghy. This is quite outrageous, as when was this voted on i.e. ‘dual rights’?? Quite explicit in stating ‘Maori’ have more than equal rights. I will follow this up, asking when was this was put into the curriculum requirements and on whose authority. To parents; I advise that they look for alternatives in schooling as there are some new ones on the scene in various places. I have trained in the Rudolf Steiner methodology which I think provides a very good curriculum for the developing person -not always easy to get the good teacher though. Graeme, what you speak of happening in that Western Springs School is exaclty what will happen on a national scale if the new constituion with its “TOW Principles” appendage, is allowed to go through….it will be a disaster. I think the only answer is that parents have to stand up en masse and engage with the schools teaching this rabid nonsense. They must state quite categorically that they don’t want a bar of it for their children. To be honest all of this clap trap has quite put me off ‘Maori culture’ forever. I don’t want to hear it. I’m sick of it and I won’t ever ‘like’ it again until they start treating us all equally and promote ‘our’ culture as well. We have a well documented culture dating back to the year dot for all to see, unlike ‘Maori’ whose language wasn’t even written down until the missionaries did it in recent times – and they also wrote it with our alphabet!! All their so-called stories by word of mouth are probably like Chinese Whispers and have subtlely changed in the telling over the centuries. Ours are documented so are indisputable. Indeed Helen. For documented factual history the Bayeux tapestry which was made nearly a thousand years ago is hard to beat. You all need to get a life! Build a bridge and get over it. Aotearoa was long before New Zealand. In fact, the name should be changed. You are all a bunch of racists. Maori should have privileges. ….Finlayson/Key….deserve a life sentence for Treason…..Political Oligarchy at its extreme….History will never never forget…..! You are all ridiculously close minded and ignorant. For a start, the bayeux tapestry isn’t factually correct and “our” stories have evolved and changed over centuries too. Reading nearly every single one of these posts makes me feel ashamed to be of British ancestry. Wake up you lot. If you believe in free speech then this will make it to your forum. I do believe in free speech, and I dare say those of British ancestry feel ashamed to be associated with you too, tinymind. If your self-acknowledged minuscule mental faculty is telling you that Maori myths (like Maui slowing down stars and fishing up islands) are more factually correct than the Bayeux Tapestry, it’s very tiny indeed. I’m not an expert on the Bayeux Tapestry, but it shows King Harold being shot in the eye, which from memory was the crucial bit.